Aging often restricts the capacity of the immune system. Endotoxemia is characterized by an immune response initiated by a group of pattern recognition receptors including the receptor for advanced glycation end products (RAGE). 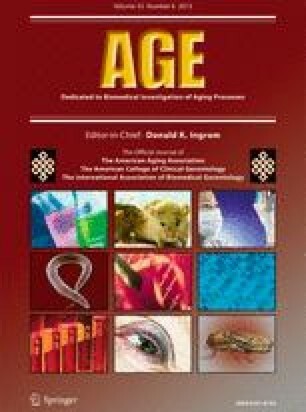 The aim of this study was to clarify to which extent RAGE and its signaling pathways such as the so called mitogen-activated protein kinase (MAPK) pathways can contribute to the perpetuation of inflammation in the aging organism. We used senescence-accelerated-prone (SAMP8) and senescence-accelerated-resistant (SAMR1) mice and studied them at the age of 2 and 6 months. Livers of SAMP8 mice had significantly higher malondialdehyde concentrations and a modest reduction of glyoxalase-I expression. Consequently, the abundance of highly modified advanced glycation end products was increased in the liver and plasma of these mice. After galactosamine/lipopolysaccharide-induced acute liver injury, significant activation of the MAPK cascade was observed in both mouse strains. Administration of an anti-RAGE antibody diminished p42/44-phosphorylation as well as tissue injury in SAMP8 mice, whereas the identical treatment in SAMR1 mice leads to a significant increase in p42/44-phosphorylation and intensified liver injury. This observation suggests that dependent on the senescence of the organism, anti-RAGE antibody can have differential effects on the progression of endotoxemic liver failure. The authors cordially thank Berit Blendow, Doris Butzlaff, Dorothea Frenz, Maren Nerowski, and Eva Lorbeer-Rehfeld (Institute for Experimental Surgery, University of Rostock) for their excellent technical assistance.